The mobile PDF app, trusted by millions. 6+ years on AppStores , 3M+ downloads, PDF Max is the world’s most popular mobile PDF app for iOS & Android. 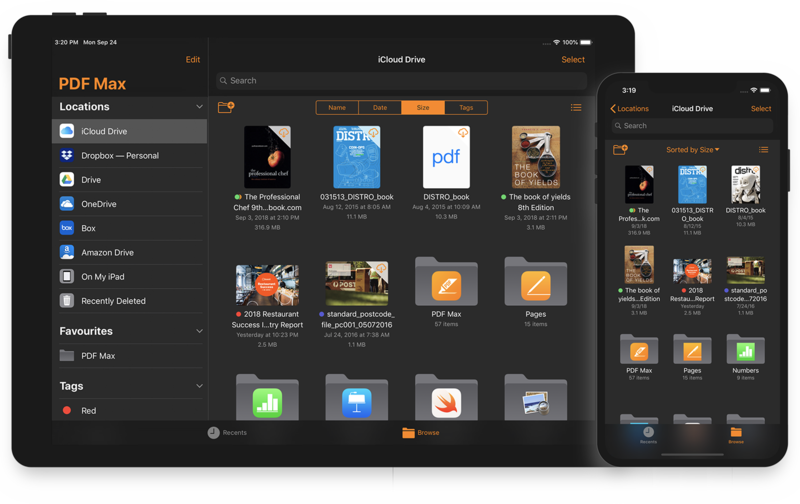 PDF Max 6 Premium is available for iPhone/iPad running iOS11 and newer. The all-new document manager allows you to minimize your time organizing documents, wile increasing your productivity working on documents. PDF Max 6 is built on latest Apple technologies with a seamless & secure integration with cloud storages such as Dropbox, Box, and many others. PDF Max 6 now looks beautiful on iPhone XS, XS Max & the upcoming iPad Pro. It also offers a better speed on old devices such as iPhone 5S or iPad Air (2013). PDF Max 6 is available as a free update for PDF Max 5, PDF Max 5 Pro & PDF Max 5 Premium users. Visit here for the differences between PDF Max Free, Pro & Premium. In the looks department, PDF Max is right up there in the “nearly modern” category along with Adobe Reader. Once you get into the reading and annotating, though, things start looking a lot nicer. If you work with PDF files on a regular basis, PDF Max is an app you should take a look at. It’s a free download, and you only have to pay for extra features if you’ll use them. The included features and tools make it a very capable PDF utility app. © 2018 The PDF Max team. All rights reserved.